Guacamole made with rich late season avocados. We live in the middle of an avocado grove in Southern California. You would have thought that since I have access to fresh avocados 9 months of the year, that I’d have more recipes using avocados. 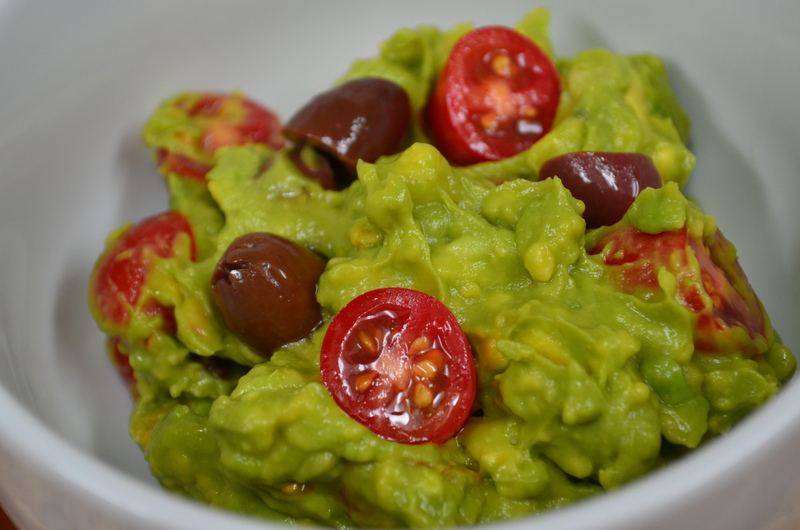 The problem is that we all like raw avocado in salad, and spread in sandwiches, and this version of guacamole so much, that we never really get much further than that! Yes, yes, I’ve tried making cold avocado soup, and putting it on pizza, but I just get strange looks from folks wondering why I’m wasting a good opportunity to eat it this way instead. It just so happens that my family doesn’t care for very spicy foods. 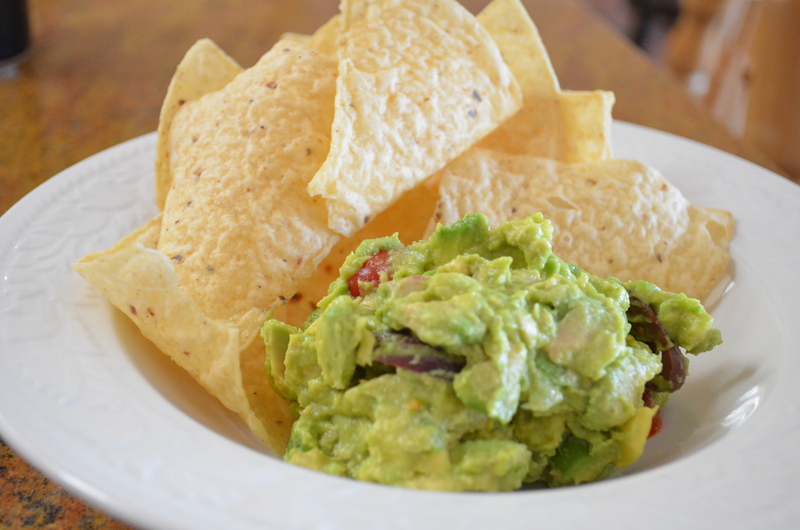 We like our guacamole without chili. (My sincere apologies go to anyone of Mexican heritage.) 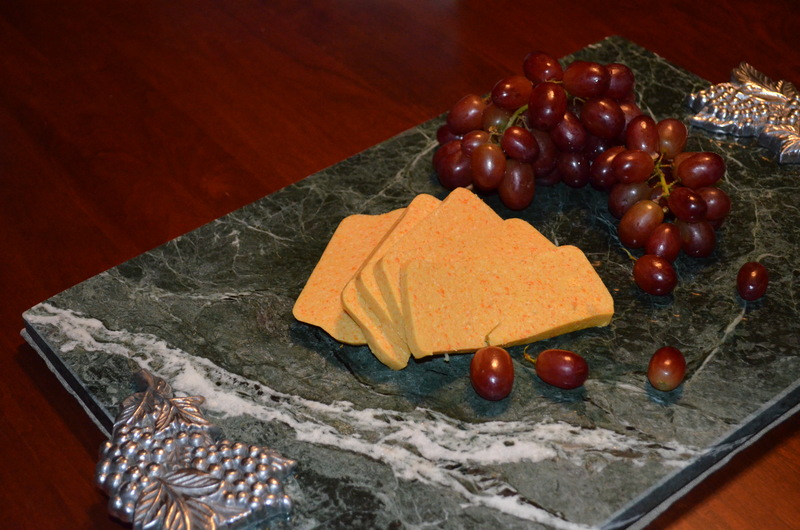 The black olives are not traditional either, but we think they’re a really good addition. Scoop the flesh out of the avocados into a bowl. 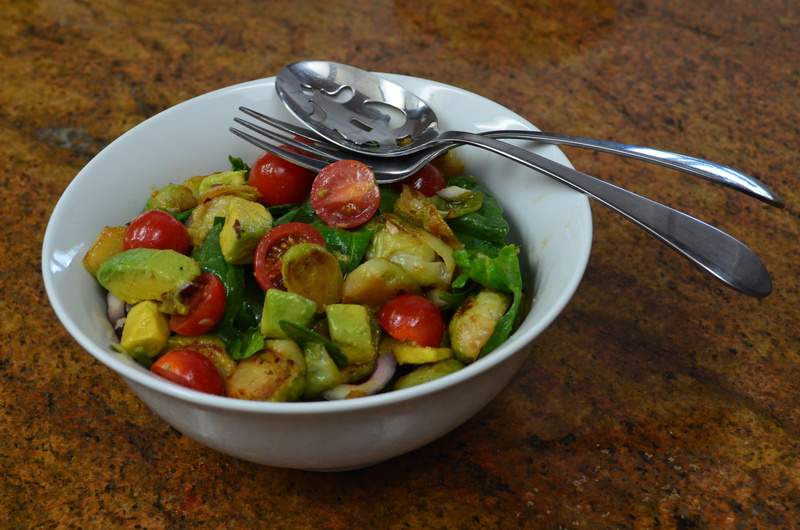 Roughly chop with the side of a fork or spoon (never emasculate guacamole by making it in the food processor). Add the other ingredients and stir to mix. 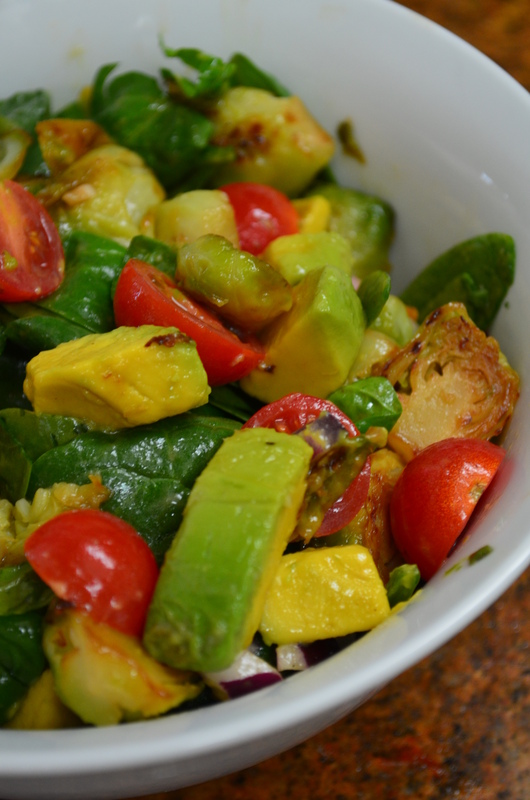 The avocado will lose its shape as you stir, and form the required lumpy puree quite easily. 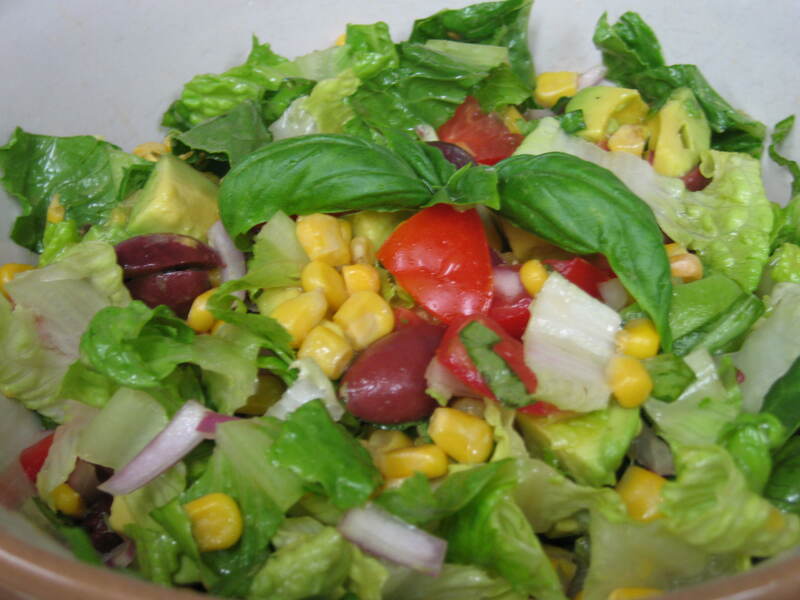 Serve with tortilla chips, or in sandwiches. …. but that last bit isn’t so easy on a gluten free diet. Tortilla chips look as if they should be a safe bet being made from corn, oil and salt, but I find that certain brands disagree with me. What’s frustrating, is that so far, the ones that disagree with me are the organic ones …. but there’s a mass market brand that gives me no problem at all. I can only guess that the big production lines have dedicated factories for tortilla chips. The almond brioche bread (toasted or not) makes a great sandwich with guacamole and crunchy undressed green salad or coleslaw. Last year, I bought The Ultimate Uncheese Cookbook by Jo Stepaniak. The reviews on Amazon pretty much convinced me that it was a good idea, and I didn’t change my mind after it arrived. If you like cooking, and you can’t eat dairy, this book is a real eye-opener to new ingredients, and new uses for more familiar ones. I rushed around cooking as many of the recipes that I could source ingredients for. This one is based on one of my favorites from that book. Part of what’s so nice about it, is I don’t feel guilty eating it. Which sounds worse for your health? Cheese, or onions, carrots, and cashews? The texture of this block cheez isn’t quite the same as dairy cheese (there is no crunch if you simmer for long enough), and it is well worth the effort to make it. The resulting cheez melts best when covered, as in quesadillas. This stuff rarely lasts more than a day in our household, so I usually double up the quantities; my kids eat it straight out of the fridge (and yes, ahem, so do I). A note to the wise, though: if you do double up the quantities, don’t try blending it all at the same time. You might be able to cook it all together, and you might be able to fit it in your blender, but it won’t blend properly with a double batch all together. If you use an immersion blender, however, there’s no problem at all. You can also add an additional 1/2 cup of fried onions after blending if you want onion strands in your cheez. Melt the margarine in a saucepan and fry the onion and carrot until softened (this adds flavor, and reduces ‘crunch’). While the onions are cooking, measure out the water in a measuring jug, and then add the rest of the ingredients to the jug. When the onions are cooked, add the rest of the ingredients to the saucepan. Slowly bring the contents of the saucepan to a boil. Reduce heat, and simmer, stirring often until the agar has dissolved (5-10 minutes). Lightly oil a 2.5 cup container. Pour into the plastic container and refrigerate until solid (>hour). Traditionally folded savory galette (square shape with filling showing in the middle), stuffed with mushroom and black olive sauce. This dish contains a chickpea miso which I think is marvelous. Miso is a diversely flavored ingredient. Some misos are very strongly flavored, some are salty, and some (like my favorite chickpea miso from South River) are mellow with a wine-y richness that I generally associate with cheese. I should tell you that I buy mine at the local health food store, as the shipping costs from buying it on line can be prohibitive. Obviously, the miso that you choose will have a major effect on the final flavor of the sauce. Put the cashews and 1 cup (8 fl. oz.) of water into a blender, and process until the cashews have all been chopped. Put the mixture aside to allow the cashews to soak (for at least 1/2 hour, if possible). In a large frying pan, melt the margarine, add the mushrooms, and sprinkle them with the 1/2 tsp of salt to draw out the juices. Fry the mushrooms over medium high heat until just softened (you might need to do this in 2 batches). 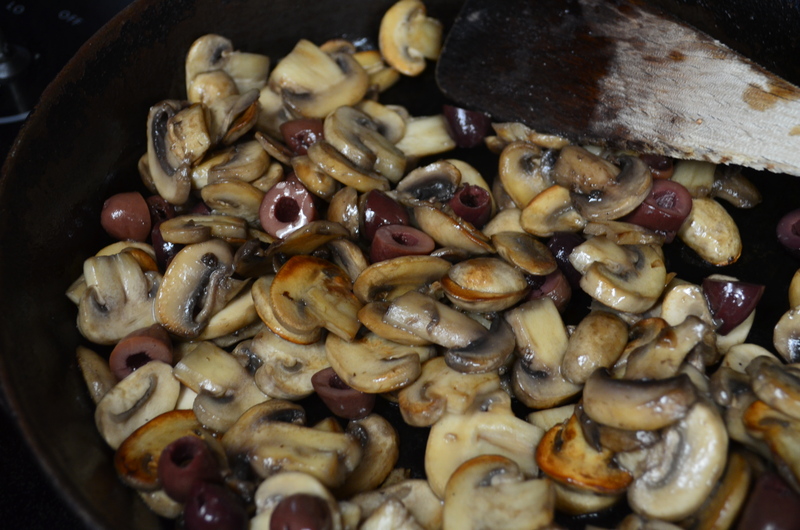 Add the black olives to the mushrooms in the frying pan. Add the remaining ingredients to the cashews in the blender, and blend again to get a smooth, thick, sauce. Stir the sauce into the mushrooms with another 4 – 8 fl oz (1/2 – 1 cups) of water. Bring the lot to a simmer to thicken the sauce, and serve. 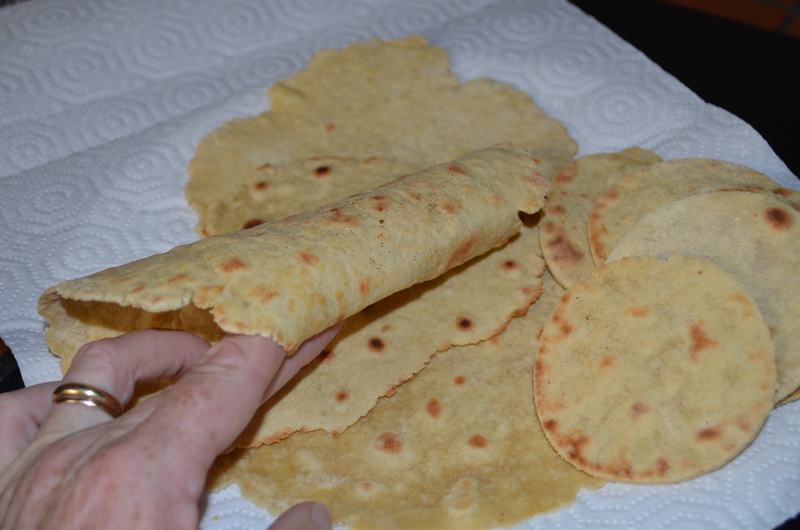 Since I first wrote this post, it has come to my notice that the tortillas come out better if the dough is blended by machine for a minute rather than by hand in order to develop the xanthan gum, though for speed and reduced washing up, I still tend to do it by hand. 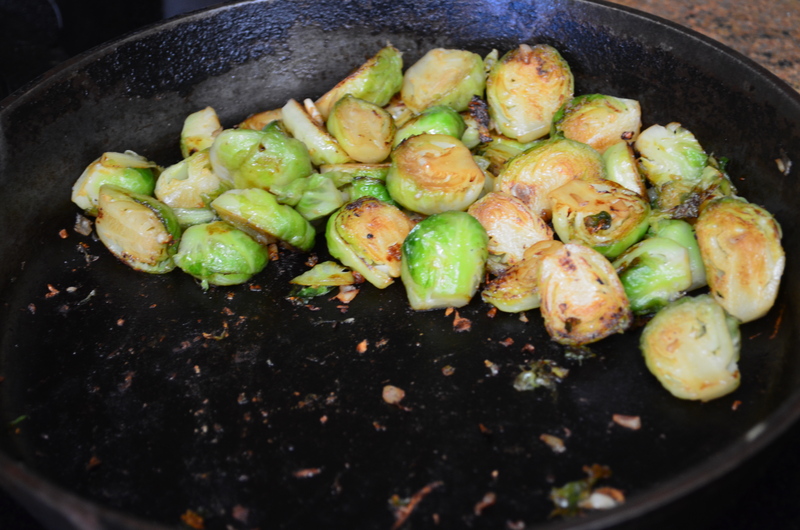 Preheat a cast iron pan or griddle to medium heat. Combine all of the ingredients in a mixing bowl, and mix thoroughly with a butter knife until a soft dough is produced. Add a little more flour if necessary to stop it from being too sticky. However, a damp dough makes a softer, better, tortilla! Kneed the dough for a few seconds to develop the xanthan gum (by hand or with the spoon/knife). Cut the dough into 8 (or 4) equal sized pieces, and form into flattened balls. Sprinkle the work surface with gluten-free flour, then roll the dough ball into a round disk about ⅛ inch thick. 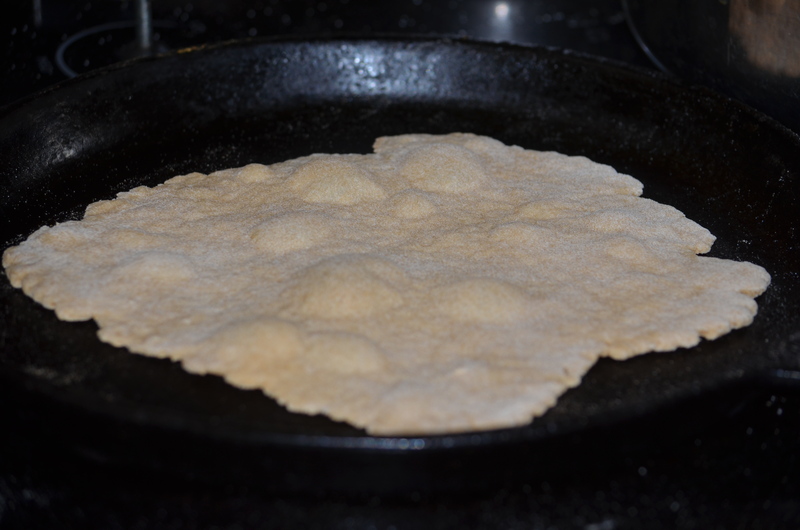 Bubbles forming on 1/2 cooked tortilla. Cook the tortillas one at a time on the cast iron pan until the top surface bubbles (about 1 minute once your pan is at the correct temperature). Turn over once the first side has some brown flecks on it. Cook the second side until it too has slightly browned. Turn the tortilla out onto a plate covered with a clean kitchen towel (or paper towel); it will become softer while it waits. Serve as a wrap, or quesadilla with faux cheez, or burrito covering. Combine all of the dry ingredients in a small food processor. Add the warm water slowly with the processor running, starting with 1/2 cup and then check the consistency. Continue to add water until a soft, cohesive, slightly sticky dough is formed. Cut the dough into 8 (or 4) equal sized pieces, and form into flattened balls. Sprinkle the work surface with gluten-free flour, then roll the dough ball into a round disk about ⅛ inch thick. Cook the tortillas one at a time on the cast iron pan until the top surface bubbles. Cook the second side until it too has slightly browned – about a minute once the pan is up to temperature.